Root > How to... > ...mark the exception as expected? Some exceptions does not indicate bugs in your code. I.e. are part of normal execution of your application. Such exceptions are called "expected". See this article for more information. Marking exception as expected will disable bug report, sending, while keeps showing dialog to the user (error message). Once exception is identified - you can instruct EurekaLog to threat this exception as expected. 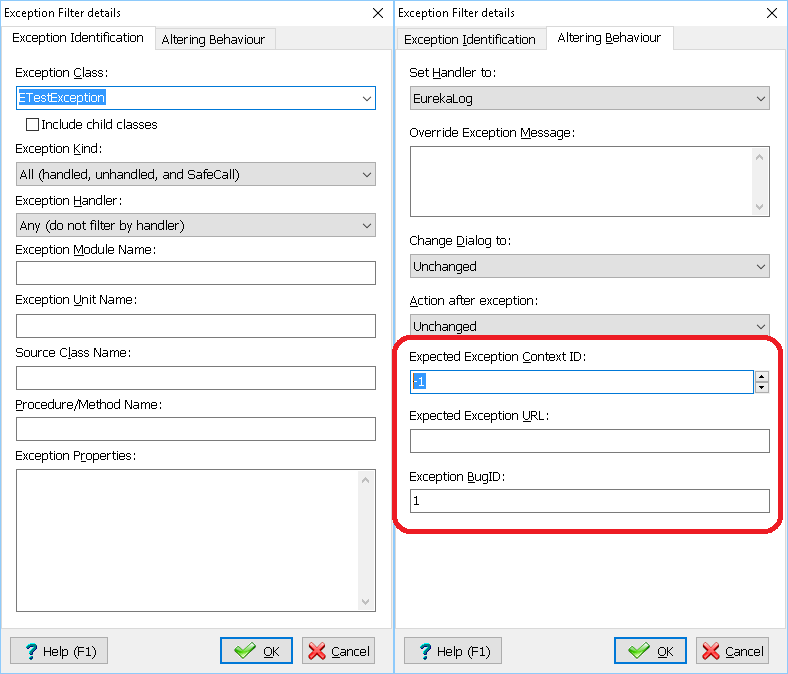 EurekaLog considers exception to be expected when it has non-zero "Expected Context ID" or non-empty "Expected Context URL". Basically, those act like HelpContext and HelpKeyword. You can assign meaningful value to show a Help button which will open corresponding help article or web-page. Or you can simply use -1 as context ID. Optionally, you may want to assign a pre-defined fixed BugID for such exceptions. Note: you may want to ignore exception instead of marking it as expected. // as if EurekaLog would be disabled. // no restart options will be visible. // as in previous example. // However, a "Help" button will be present. // "Help" button will be visible. // as in the first example above. // the same fixed BugID. // Additionally, a "Help" button will be shown. Use explicit code to raise expected exception. Use explicit code to mark existing exception as expected.